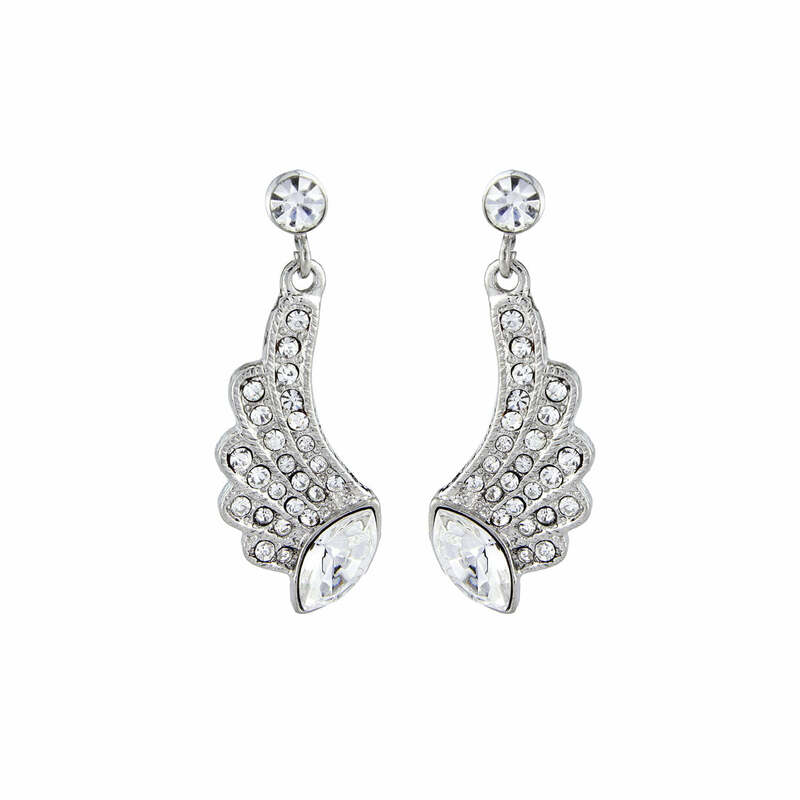 Beautiful Deco angel wing crystal earrings for women who adore the glamour of Gatsby. Inspired by the iconic Art Deco period, our Deco Angel Earrings ooze glamour and All That Jazz! Featuring a single clear Austrian crystal stud leading to bejewelled crystal feathered wings opening from a sparkling clear Austrian oval crystal, these beautiful drop earrings frame and flatter the face perfectly with their symmetrical design. Fabulously versatile, this pretty pair is sure to spend very little time in your jewellery box. For the bride wanting to achieve Roaring Twenties style, team with a fabulous crystal encrusted forehead piece and drop waist gown for sensational Gatsby Glamour. Or for a more understated and classic bridal look, coordinate with a timeless bejewelled bridal bracelet and vintage inspired wedding dress. With a feathered angel wing design, these pretties are the perfect choice for bridesmaid earrings to accessorise your ‘maids with a touch of 1920s glitz!